I’m sure that the 15 partnerships supported under the Big Lottery Fund’s £82 million programme to tackle social isolation, which I wrote about earlier, will produce excellent projects over the next five years – but how about the other areas that pitched but did not get funding? And what sort of projects may be developed in future when public sector funding will be even tighter than it is today, as the retiring head of the home civil service, Sir Bob Kerslake pointed out the other day? Drew Mackie and I used the opportunity of a seminar about social media, community and local local government, run by LGIU and Globalnet21, to explore that recently. Thanks to Francis Sealey of GN21 for the opportunity. Do take a look at the other GN21 excellent events and webinars. In Slipham a partnership of local organisations recently failed in its funding bid for a five-year programme supported by the Big Lottery Fund to combat social isolation among older people in the town. broaden the scope of the programme to cover anyone challenged by loneliness, or aiming to enjoy living alone. research and map local resources and networks that can provide ideas, support, activities or funding – and build relationships to make the most of these. help people and organisations use digital technology and innovative approaches to meet their needs and interests. 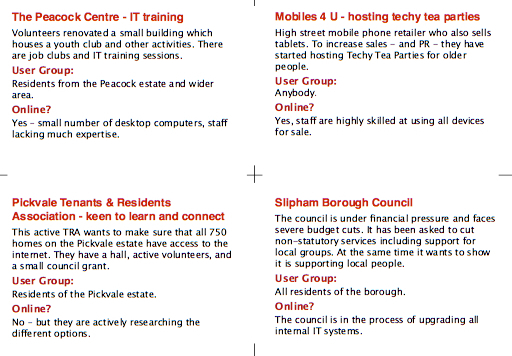 How can we help Slipham people and organisations use technology to help tackle loneliness and/or support living alone. The groups developed project briefs, and then exchanged these. 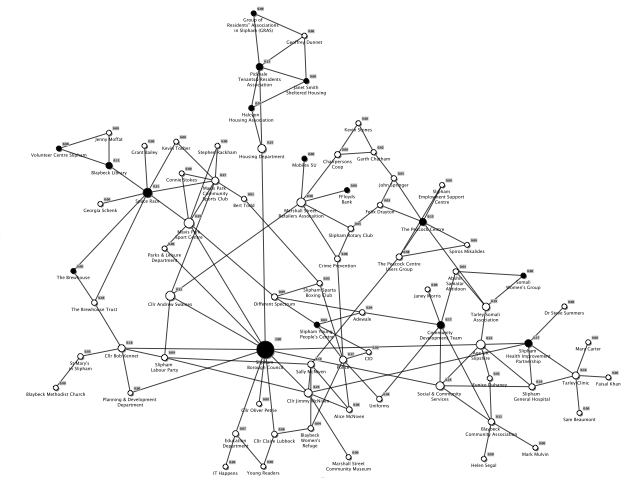 At this point we introduced another dimension – a social network map of Slipham. 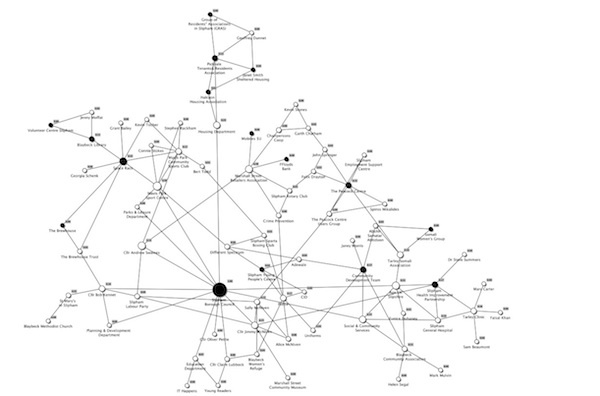 The map showed the original partnership organisations, and also more than a dozen others. As well as the map we produced a table showing the assets each organisation held – premises, skills, equipment, membership, funding. We asked participants to review the map and assets held by organisations, and consider what new connections would be helpful in developing projects. We also offered a set of method cards that provided ideas on how to both build the network and develop projects. I hope that we may be able to run a similar workshop “for real” with some of the partnerships or other organisations exploring how digital technology can be used to help tackle social isolation, and support programmes for well-being. 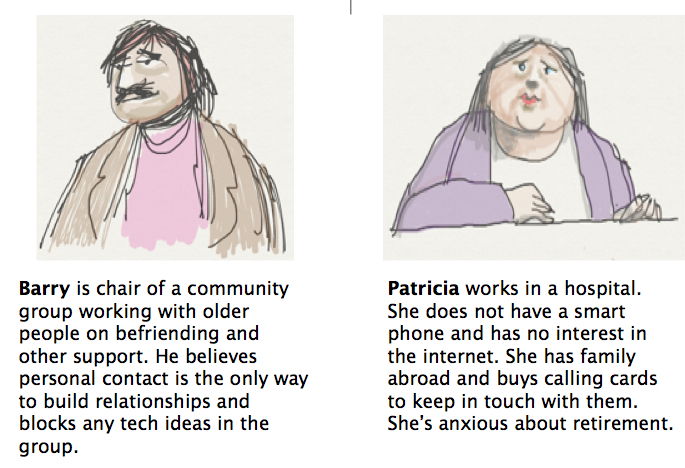 I used some of the insights from that work, as well as the exploration we did for Nominet Trust into digital technology in later life, to inform our workshop design. The Campaign to End Loneliness workshop provided some examples of specific technologies that could be used in projects, and these and other ideas could form the basis for planning development “for real”. Declaration: the winning partnerships are being supported by Hall Aitken, and I made some early contribution to their work on asset and network mapping. Ideas here are my own. Follow @HallAitken for updates on the programme. Posted on September 27, 2014 by david wilcox. This entry was posted in All posts, events, games and tagged ageingbetter, dtlater, game, games, socialisolation. Bookmark the permalink.